Pakistani journalist Midhat Ali Zaidi is spending three weeks at Rocky Mountain PBS as part of the United States - Pakistan Journalist Exchange program. She's chronicling her first visit to the U.S. for I-News. Away from home and from the care of those who escorted the fellows of the U.S. – Pakistan Journalist Exchange program in Washington D.C. and prepared us for any culture shock we might experience in the United States, I began my three-week work placement in Denver. 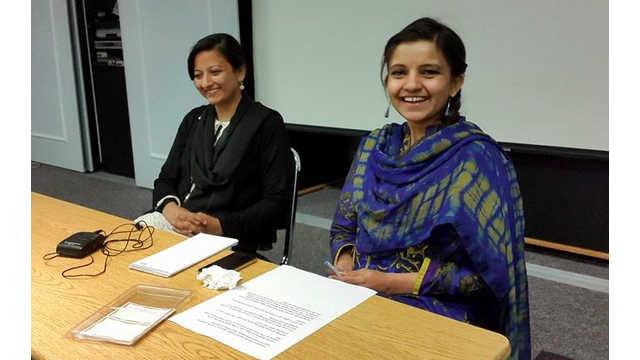 Pakistani journalist Midhat Ali Zaidi, right, at RMPBS with fellow Pakistani journalist Saman Iqbal. I have to admit that I felt a sense of disappointment when I first learned where I would be working just a couple of days prior to departure from Pakistan. I had been expecting to be placed somewhere like New York. But NYC is what you think of as America when you are a Pakistani traveling to the U.S. for the first time. And travel I did! With a 24-hour-long journey to the States and another flight from D.C., I finally landed in Denver, a city nestled at the foot of the mighty Rockies. Though I had done some Google searches on Denver, I was not at all prepared for the spectacular views it had to offer. Denver is similar to Islamabad — the city I have chosen to call home back in Pakistan – in that it’s an urban center, yet in close proximity to the mountains. A walk through the downtown area and I was instantly in love with the life and liveliness of Denver and its mostly young population. But the reason for sending us on this media placement was not to take leisurely strolls or form opinions about the geography. We were to learn about American journalism and how local media operates here. What better place to get a taste of true American television than to be in a PBS newsroom! Beginning the first day at work with the Monday morning news meeting, we discussed potential local ballot measures coming for this fall on issues like fracking, and even a potential measure on dog euthanasia being banned under certain circumstances. ‘What kind of people are they?’ I think to myself, wondering why they aren’t discussing important issues like world terrorism and their country’s role in the global war. Over the course of my stay I would learn that Americans live in a kind of disconnect from the happenings in the Middle East and Afghanistan, except, of course, for the fact that they, too, receive home the bodies of their citizens who are victims of terrorism. Realities of life can be much the same in America as they are anywhere else in the world. The white-washed facade of an American lifestyle struggles to hide realities like poverty, homelessness and the pains and grief that go side-by-side with human existence. As I learn more about America and the people that live here, I find them to be the most openly honest and genuinely nice people I have come in contact with. Their graciousness and hospitality impresses me to no extent, but at the same time I see the elderly homeless guy who sits on the sidewalk outside my hotel, never attracting the attention of passersby. This blog was also published on the web site of the International Center for Journalists.